If you’re on the precipice of adding a pet to your home and can’t decide between a dog and a cat, the deciding factor may very well boil down to time and energy. Obviously, it’s a huge commitment any time you add a furry friend to your family, but some pets are decidedly less work than others. So what about our BFFs — or best feline friends? How low-maintenance are cats… I mean, really? It seems as though a lot of people on the fence between adopting a cat or a dog err on the side of the cat due to a preconceived notion that cats are low-maintenance pets. In fact, if you Google “low-maintenance pets,” cats are highly likely to pop up on the top of many of the lists returned by the search results. So to get to the bottom of whether or not cats really are better-suited for time-strapped humans than their canine counterparts, I decided to compare the general care criteria for each species as outlined by an organization who certainly knows a thing or two about both: the ASPCA. Let’s take a look at the breakdown before we explore other theories, shall we? As puppies, dogs need to be fed multiple times throughout the day, depending on age. However, this tapers off around their first birthday, and one meal per day generally suffices. While cats don’t need to eat as frequently when they are young, they do have certain specific dietary needs — most notably taurine, an essential amino acid that aids in heart and eye health. Both dogs and cats require a steady supply of fresh, clean water. And, similarly, treats should be limited for both. Again, this is basically a draw. In general, neither dogs nor cats require much bathing. In fact, most breeds can get away with a few times per year. However, these needs may increase if you are dealing with long-haired breeds or breeds with other special considerations. 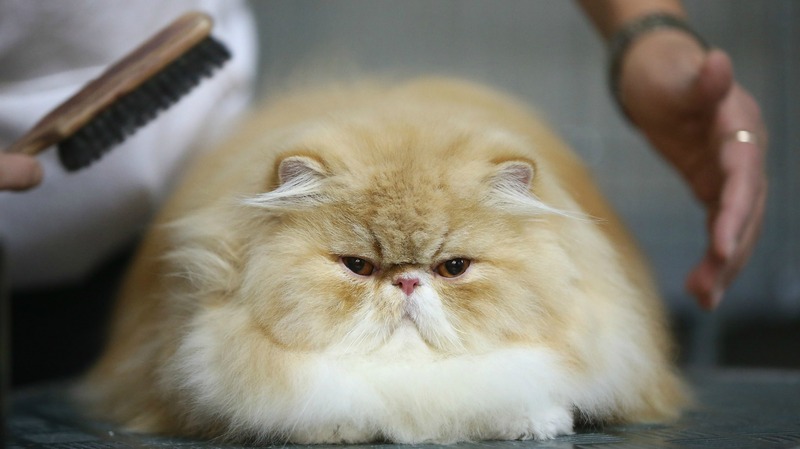 Both dogs and cats should be brushed frequently to help keep their coats clean and prevent matting. Both cats and dogs need a warm, quiet, clean place in the home to rest. Their bedding should be washed frequently. While dogs are more amenable to being outdoors for longer periods of times, outdoor cats do not tend to live as long as indoor cats. We all know the deal, right? Dogs do it outdoors, which must be picked up in most municipalities. Fortunately, most urban areas have designated doggy poo disposal bins. Cats, as they are indoor creatures, require a litter box. Just as you must pick up your dog’s doo anytime he goes on the neighbor’s lawn, you must also scoop your cat’s litter box every single day. If you don’t, your cat will throw you side-eye for life. Plus, it’ll get gross. Once a week, you should dump the kitty litter and wash the box with a mild detergent. Cats and dogs should both see the veterinarian at least once a year for their annual shots and a wellness check. Dogs and cats should both be neutered/spayed to prevent overpopulation as well as future health problems associated with unaltered pets, and this procedure typically costs slightly more for dogs than for cats. Dogs, unlike cats, do require more exercise in order to torch calories and keep their minds stimulated. A listless pup can quickly become a trouble-making pup! While cats don’t need to be taken for walks per se, they also require something to curtail destructive behavior: a scratching post. Cats need to scratch, so you need to provide them with a designated place to do it. There you have it — on the surface level, dog and cat care is remarkably even-matched where time and energy is concerned, with cats gaining a slight edge simply because they don’t require as much exercise as dogs. But is there more to it than that? Dr. Eric Barchas believes so. During an interview with Catster, the veterinarian opened up about how his opinion regarding the maintenance level of cats has evolved over time. It’s not merely a matter of cats being less maintenance because you don’t have to walk ’em. As it turns out, neglected cats often fall victim to a condition called feline idiopathic cystitis, which results in the bladder and the urethra becoming agitated. Not only is it excruciating for the poor cat, it can actually be life-threatening for male cats (who are cursed with super-narrow urethras). The notion that cats require as much — if not more — physical and emotional attention as dogs is echoed by the Humane Society of the United States. Because cats are very sensitive creatures, they explain on their website, they need affection and energy channeled their way in order to stay stress-free, healthy and happy. To accomplish this, the Humane Society recommends playing with your cat for 10 to 15 minutes twice a day through games like chase or fetch. Sounds kind of like the exercise requirements for dogs, eh? You should also ensure your home has plenty of interesting and cat-appropriate things for your feline friend to explore in order to prevent boredom. This may include hiding food in various spots around the house for your cat to find or even rubbing a little catnip on your kitty’s toys. You should create a safe environment too. The Human Society suggests providing hiding places, resting spaces and calming products aplenty to give your cat a calm feeling at all times. And lastly, you should stick to the routine. Cats do not like change. It makes them antsy, insecure and just downright cranky sometimes. Accordingly, you should do your best to stay on track with your typical schedule. If this all sounds like a lot of work, that’s because it is. It goes without saying that any pet is, but the big picture here is that cats aren’t exactly the extremely low-maintenance companions they are often made out to be. Just like dogs, they require lots o’ time and energy. Although if you’ve ever tried to work on a laptop with a cat in the room, you’re probably well aware of their, ahem, unique attention requirements.